0.0 From the Pantoll parking lot, cross Panoramic Hwy and take the paved Pantoll Rd. 200′ uphill to the Matt Davis trail signed to Stinson Beach. The trail starts out along open hillside, but soon enters dense woods of Douglas fir, oak and bay. Spring wildflowers along the trail include white zigadene, yellow poppy, blue hound's tongue, blue-eyed grass, blue dicks and iris. 1.3 Junction. Unofficial trails cross here. To the left, short spur trails lead to a lookout point offering better views of the coast. On the right, a trail climbs up to join a higher trail on the hillside. 1.6 Junction ➊. The Matt Davis trail heads downhill. Stay right to climb gently on the Coastal trail. In summer, grasses crowd the trail. 2.4 Rock outcroppings. Green-grey lichens enjoy the cool and moist coastal climate on these small rocky patches. 3.3 Junction ➋. 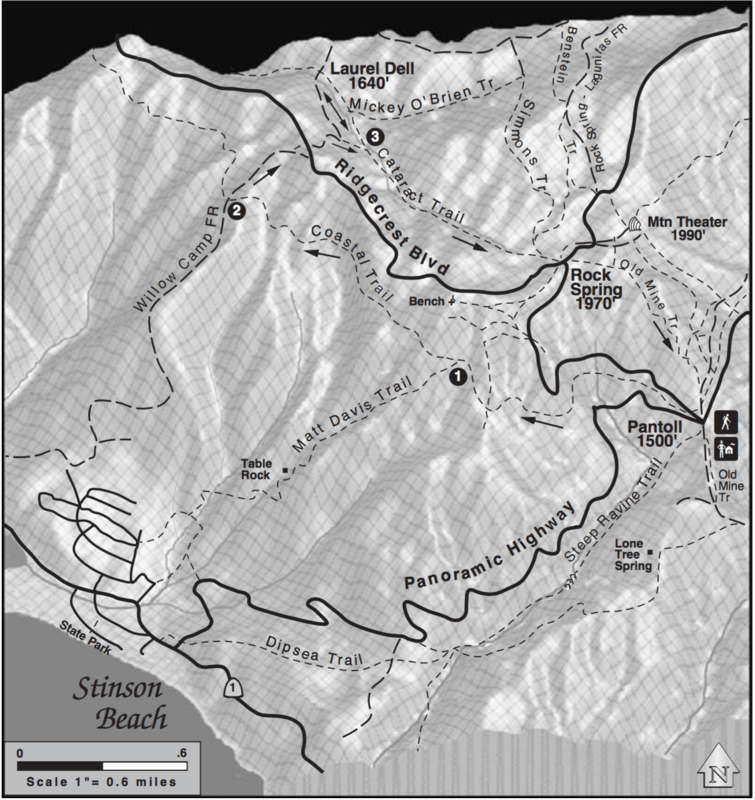 Turn right and take the Willow Camp FR steeply up to the first knoll, then take the short trail left to Ridgecrest Blvd. 3.5 Highway junction. Continue on the dirt road to Laurel Dell. 3.8 Junction ➌. Take the short connector trail right over the bridge on Cataract Creek. Then, go left on the Cataract trail to Laurel Dell. 4.1 Laurel Dell picnic area. Continue north on the Cataract trail. 4.2 Waterfalls and turnaround point. Beneath a big-leaf maple, moss-covered rocks and ferns, Cataract Creek starts its vigorous plunge to Alpine Lake. To continue the hike, backtrack south along the left side of Cataract Creek towards Rock Spring. 4.6 Junction and airplane engine. About 100′ past junction ➌, down in the middle of the creek, look for a Navy Corsair airplane engine, the result of a mid-air plane collision October 4, 1945. 5.6 Rock Spring. Cross the highway, bear left and take the signed Mtn. Theater fire trail uphill, then right on the Old Mine trail. 5.9 Rocky knoll and spectacular views. Continue downhill. 6.6 Back at Pantoll Ranger Station. Full facilities.